I love watching cooking/food tv shows.Current tv shows that I've been downloading and have been watching are described in the title of the post. 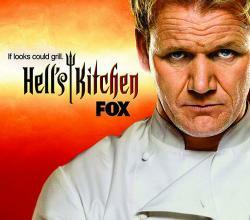 I'm going to break down what the shows are all about. 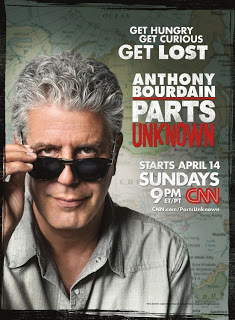 If you're a fan of Anthony's No Reservations like I am,you should definitely watch this series.It's a bit different than No Reservations but he still eats a lot of good food.The different is that he goes to places that are either controversial/far off or have been in political turmoil.The last episode will come out soon,which by what Bourdain tweeted about will be about Congo. Some of my favorite episodes were when he was in Los Angeles and Canada.In Los Angeles he went to Koreantown,and explore the history of LA Riots.In Canada,he met these two chefs that really like to eat good food.They carried black truffles with them everywhere!Even when they went on a train ride,they shave the truffles on their omelets.That episode was amazing.People in Quebec,Canada eat like kings.haha. The other episodes like Morocco(Tangiers) and Libya was good too because we could see how the situation there is now.Especially in Libya,which Bourdain said was his best episode ever.It was quite dangerous for them as well,judging by what I watched. There's only 8 episodes in total,and you can download all of them on eztv.it. 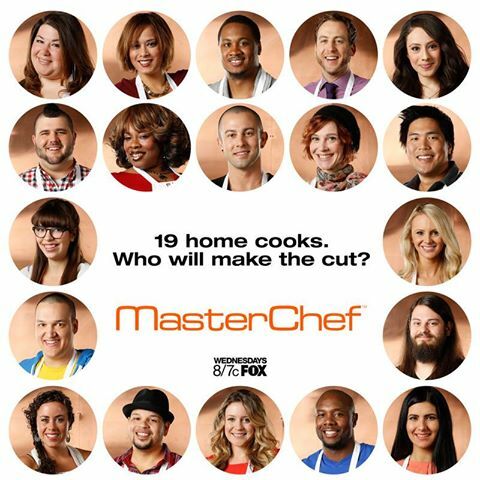 I love Masterchef USA.The three judges are awesome--Gordon Ramsay,Joe Bastianich and Graham Elliot.This time for season 4 the auditions was even tougher. Some of the challenges this season was very interesting..they had a lemon meringue pie challenge,macaron challenge,there ingredients that Malaysians are familiar with that was inside the mystery box--rambutan/tempeh,there was a wedding challenge where the bride had a long list of things that she doesn't eat,there was a dozen cupcakes to be baked for an elimination challenge,a butter poached lobster challenge(which I think is the hardest thus far!) and also an eggs benedict elimination challenge. Right now the season is up to episode 15 and I'm loving it!Among all of the contestants,I'm very fond of Jessie because not only is she super pretty but she can cook very well! But remember the winner of Masterchef season 2,Jennifer?Her meal was thrown into the dustbin by Joe a few episodes early in the competition.So the winner could be anybody as long as they're willing to improve.But I've to admit that there has never been a male Masterchef winner! Can you believe that it's the 11th season now?I have to say that this season,the blue(guy's) team got beaten hard.They just keep losing every challenge!It was very painful to watch.Right now,there's only three contestants left.Two girls and one guy. I've no idea who will win though!